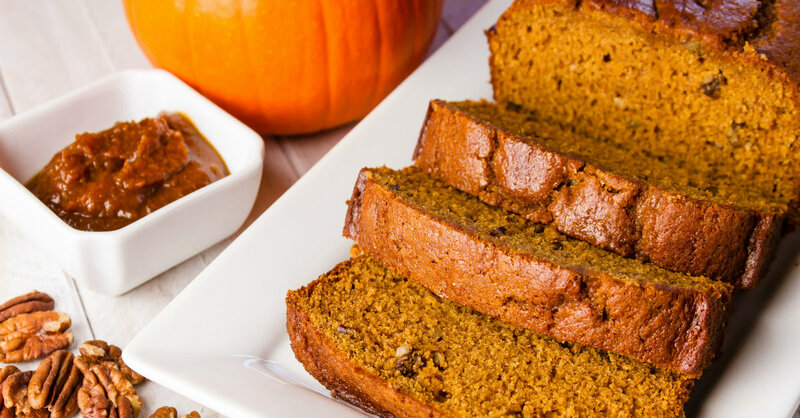 This Ginger-Spiced Pumpkin Loaf Will Get You Ready For Fall In No Time! Who’s ready for fall? When the days get cooler and the leaves start to turn, it’s nice to have some culinary options to embrace the changing weather. This recipe is perfect for those days! As a general note: this pumpkin loaf is equally as good without any pecans or when using only cinnamon and nutmeg, so if that’s all that’s in the pantry, it’s fine—your house will still smell amazing! 2. In a medium-sized bowl, mix the flour, salt, baking soda,and all spices (ginger, cinnamon, nutmeg and cloves) together. 3. In a separate bowl, mix the pumpkin purée, pecans, melted butter, sugars, molasses, eggs and water together until blended. 4. Combine the wet and dry ingredients and mix until just incorporated. 5. Divide the batter between the two loaf pans and bake for 1 hour or until inserted toothpick comes out clean.